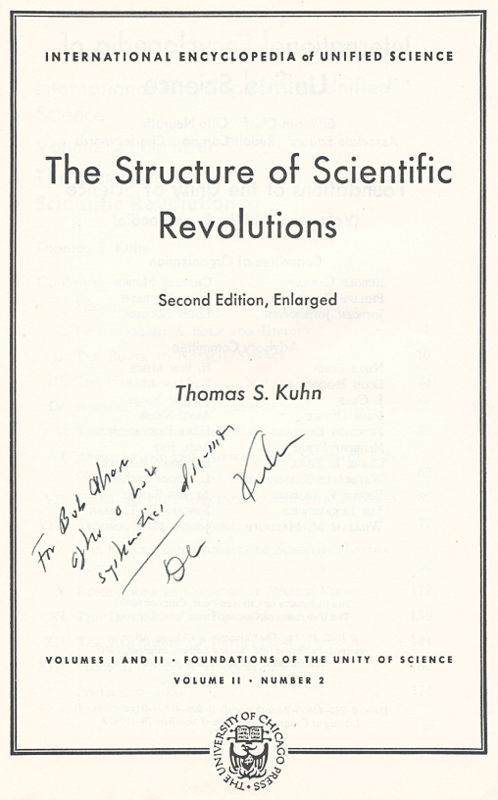 RJO’s copy of Thomas Kuhn’s The Structure of Scientific Revolutions , inscribed “For Bob O’Hara | after a hot | systematics discussion | Tom Kuhn.” The inscription was written in the Romer Library of the Museum of Comparative Zoology at Harvard following a meeting of the Systematics and Biogeography Discussion Group. Kuhn and Gareth Nelson had been guests at the meeting. Kuhn began his career in physics at Harvard University, but later turned to the history and philosophy of science. He taught at Princeton University and at MIT, and published a series of highly influential books including The Copernican Revolution: Planetary Astronomy in the Development of Western Thought , Structure , and The Essential Tension: Selected Studies in Scientific Tradition and Change .